SpaceX's reusable Grasshopper rocket is growing up. And up and up and up. 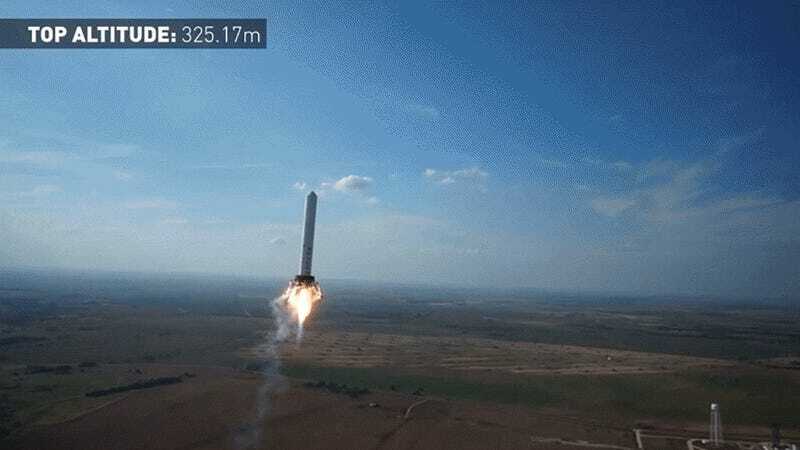 It just set a new record for height, hovering at over 325 meters (1066 feet)—higher than Manhattan's Chrysler Building—and hovering there, before coming back down and landing on its launchpad safely. The Grasshopper itself is a 10-story Vertical Takeoff, Vertical Landing rocket. It's made from "a Falcon 9 rocket first stage tank, Merlin 1D engine, four steel and aluminum landing legs with hydraulic dampers, and a steel support structure." Unlike other rockets that are designed to burn up on re-entry, the Grasshopper can withstand the heat, and be used for further launches. The previous record had been 250 meters, and the very first flight was a mere 3 seconds at six feet, just this past September. The big bottleneck is mostly a software issue, jiggering flight and landing algorithms, which were used for the first time this flight.